An approved Treatise of Hawkes and Hawking. Divided into three Bookes. The first teacheth, How to make a short-winged Hawke good, with good conditions. The second, How to reclaime a Hawke from any ill condition. The third teacheth. Cures for all knowne griefes and diseases. 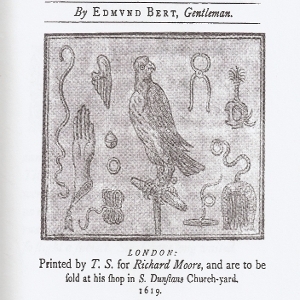 By Edmund Bert, Gentleman. The author, who lived at Collier Row, near Romford, Essex, details his method of training the Goshawk, in which he was very successful. He used to ride out of Essex into Sussex to hawk over the downs, where, he says, " I have killed for the most part of a moneth together with an intermewed goshawke eight, nine, or tenne Partridges in a day. The day of my going thither and the day of my returne to London was just five weeks, and it was a fortnight or more in Michaelmas terme when I came backe. I killed in that time with that one hawke foure score and odd Partridges, five Pheasants, seven Rayles, and four Hares against my will." He had " for a Goshawke and Tarsell a hundred marks both solde to one man within sixteen months ". For another Goshawk he was offered " fortie pounds ", and ultimately sold her for thirty. In 1795, a silver " varvel," engraved with the name "Oxenforde," was found near Headingham Castle, the ancient seat of this family in Essex. It is figured and described in the Archceologia, and may well have belonged to the nobleman to whom this book is dedicated. - Summary by James Edmund Harting, 1891.